You can be FOR ethics and AGAINST this initiative! Can a person support ethics reform and yet reject the 2010 Ballot Initiative of Utahns for Ethical Government? It is difficult to oppose ethics reform. The title passes the smell test. The brief descriptions of the Initiative pass the smell test as well. Not many people look deeper. Which is why it makes a great vehicle for sneaking subtle but profound changes into law, changes that would give the upper hand to special interests that have found Utah to be a difficult state to manipulate. This initiative might sail through because no one can attack it. I'm sure the legislators see its problems, but they can't speak against it without looking like they have something to hide. This is why I feel compelled to come forward. First, I never ran for office. Until recently I never thought that I would do anything political, so I have no political baggage that prevents me from speaking out. Second, as someone trained in law (BYU Law School, 1995), I can see this bill's flaws. 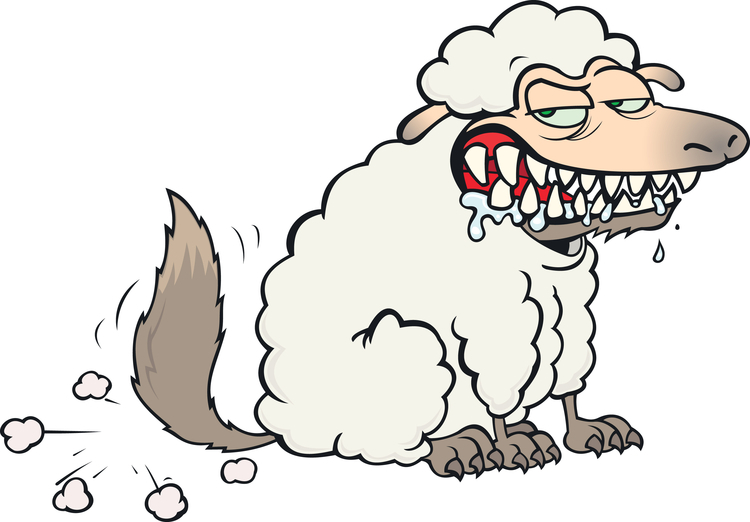 I am shocked and appalled to find a wolf under the sheep's clothing. And in an ethics reform bill, of all things! I would really rather be programming my computer and selling software on the Internet (I don't practice law for a living). But I can't just do nothing while some sneaky people try to pull the wool over our eyes and place themselves in power over Utah. I'm all for ethics. So are most Utahns. A new Deseret News/KSL-TV poll conducted by Dan Jones & Associates finds that 85% of Utahns like the idea of an independent ethics commission that would investigate charges of lawmaker wrongdoing and make recommendations for discipline to the Legislature. But the citizens ethical reform initiative currently being talked about is not the way to do it. Most citizens hear about the initiative and are initially for it. When citizens read this initiative, House Majority Whip Brad Dee, R-Washington Terrace says that "when they do [read it], many change their mind, seeing how far-reaching it is." This web site explains how the so called ethical reform initiative is actually unethical itself. It is a dream come true for someone who wants to politically assassinate any legislator that they do not like. The Initiative is directed at legislators only. What about other public officials from your mayor to the Governor? Don't they need to be ethical too? This omission really makes me wonder. There are some things that only legislators can do. For example, only the legislature can ratify a proposed amendment to the U.S. Constitution. The integrity of the U.S. Constitution is in the hands of legislators of the fifty states. To me, this means that it is extremely important that the legislators in office are the ones elected by the people. No commission should be empowered to overrule the will of the people. We already have ways of dealing with issue when they come up. The recent, immediate resignation of two legislators demonstrates that we don't need a commission to perform a witch hunt. The Initiative was drafted without transparency. When the Legislature drafts proposed legislation, the entire process is visible to the public and subject to input from the public. Arguments for and against are heard and made part of the public record. You can read it or listen to the audio recordings. The record of proposed amendments is particularly valuable. This public record becomes the "legislative history" that is used by courts to determine the meaning of the law and the intention of the legislature. In contrast, I have yet to see any "legislative history" of this Initiative. I never saw a draft prior to the final draft. Never heard any arguments about how something should be worded. Never heard of any public hearing or opportunity to offer a suggestion or even read it prior to its final version. I can't even determine for sure who was responsible for drafting it. It came out of a black box, the proverbial "smoke-filled room," and now is shoved down our throats as "the will of the people." The sponsors of this bill appoint themselves to unelected, unaccountable, lifetime positions of power. When the Sponsors explain it, they say a five-member ethics commission is appointed by the leadership of the legislature, drawn at random from a pool of 20 independent-minded citizens who are chosen by unanimous agreement of the president of the Senate, speaker of the House, and the two minority leaders of the Utah Legislature. 1. There is a backup plan they don’t like to talk about. The two republicans and two democrats might not be able to agree on all of 20 names, along with the 20 persons agreeing too, by the stated date. So the Sponsor’s backup plan gives the power to select all 20 candidates to the Sponsors themselves. There is no provision that requires the Sponsors to consider any of the legislators’ candidates that they did agree on, if any. They get to start from scratch. This self-serving power grab, an unspoken backup plan hidden behind a fragile advertised plan, is enough for me to distrust the Sponsors. I smell a hidden agenda. They tried to assure me that the backup plan is there to pressure the four legislators into unanimous agreement. Does this make it less self-serving? Only if you don't think it through. In a negotiation, the greatest power is walk-away power. The power to demand concessions will gravitate toward whichever legislator thinks most like the Sponsors, because that legislator is willing (or wanting) to let the whole process fall into the hands of the Sponsors. With total veto power, that legislator can demand anything. Thus, the will of the Sponsors can be exercised through pressure to demand concessions during the primary plan. Click here for more on the power of the Sponsors. 2. It is advertised that the five commissioners are chosen from the 20 randomly. If the proposed law had merely said it was to be random, then there would be a court-reviewable standard of randomness. Instead, the proposed law fails to require randomness, and goes out of its way to specify a method that is ripe for abuse by sleight of hand. It invents a new and unusual method of picking the five. It uses the word “random” not for how the commissioners are chosen but for who is doing the choosing, which is not the same thing. It's like it’s doing a limbo dance under the bar of randomness without ever actually touching it. The first Vietnam draft lottery (in 1969) was done by pulling identical capsules out of a container that had been well mixed. Yet this lottery was determined to be not random and was replaced by a better method used in all subsequent draft years. The proposed law is even worse than this flawed lottery because this law does not sufficiently hide the names from all participants and it does not require any shuffling or mixing at all. Of course, after the sponsors pick all 20 candidates, it won’t matter to them how the five are picked. An independent commission to oversee ethics reform for government sounds good on the surface, but what's hidden inside this "reform" bill is a really big problem. The Sponsors of this initiative are right; this initiative is all about reform, but not in the way they lead people to believe. Why can’t a more reasonable method be determined to choose these 20? Why can’t each side just pick 10? Or only require that 3 out of the 4 agree? Or have the entire legislature vote on any candidate anyone submits and pick the five with the highest number of votes? Almost anything is better than that unspoken plan that throws the power back to the self-appointed Sponsors. No checks and balances. This initiative creates a fourth branch of government with immunity from judicial, legislative, or executive branch oversight. Monarchy anyone? Or is that an oligarchy? Legislators no longer allowed to help constituents. Traditionally, members of the legislature often help their constituents, the people they represent, whether they are voters or not. However, this bill views actions taken on behalf of constituents unfavorably, as if they were attempts to gain political advantage, and makes them ethical violations and grounds for removal from the legislature. Definition of lobbyist is too vague and too broad. Lawmakers would not be able to be lobbyists while in office or for two years later. But Utah Democratic Party Executive Director Todd Taylor says that "the initiative's definition of a lobbyist might be overly broad, and could potentially apply to anyone who's ever spoken to a public official. This is a very expensive commission. This initiative wants at least $472,000 per year. On top of that, tax payers will also pick up the bill for covering the legal fees the law makers incur in defending themselves against these ethics complaints. This legislation would not end scandals. It would make them multiply. With new rules forming a minefield for legislators, enemies of certain legislators would have much more to work with. And does anyone think that a new five-person commission and executive director plus staff, funded with at least $472,000 a year, and nothing better to do than find and investigate ethics violations, will come up empty handed year after year? The one fair provision is that the accused legislators may each hire any attorney or law firm they please and the taxpayer will generously pay the bill, and this is over and above the nearly half a million allocated to stirring up trouble. All of those legal fees come out of our tax dollars. This initiative would discourage grassroots politics. Senate leaders said that they have serious concerns about the ethics drive, fearing it could deter qualified people from serving in the Legislature out of fear of falling victim to ethics complaints. Guilty until proven innocent, and they can go back 6 years looking for ammunition! Sen. Lyle Hillyard, R-Logan, a lawyer and the longest-serving legislator, said the ethics petition as it is crafted could "seriously limit anyone who wants to run or get involved in the legislative process." The citizen's initiative would allow any three citizens to file an ethics complaint and issue subpoenas. If the complaint is deemed to have merit, the accused legislator will then have the burden of proving he or she is not guilty. And it would apply to any suspected ethical violations in the last six years. That could open lawmakers up to allegations stemming from the politically polarizing voucher debate, Hillyard said. "In this political environment we live in now, life is too short," Hillyard said. "You'll have a lot of very honest people who will say it's not worth the price." Unclear rules. Ethics rules should be somewhat intuitive. This initiative creates so many rules to follow, it becomes difficult to interpret your actions to make sure you are following all of the rules. Take this one for example: The initiative will be put an end to all lobbyists gifts, save for light refreshments of virtually no value. So let's say the lobbyist and law maker are at Costco. The hot dog combo is a buck fifty, but the frozen yogurt is about two dollars. So would it be correct to take the "gift" of the hot dog (the lesser value but not a "refreshment"), or the yogurt (the "light refreshment" but higher value)? Even the IRS has a provision that you can give gifts to clients, employees, etc. as long as the value is under $25. That is much more clear, easy to understand, and easy to follow than such nebulous phrases as "virtually no value" or "light refreshments". And in the mean time, I don't think a meal is going to unduly influence a law maker to entice them to vote in favor of a lobbyist's cause. Right to privacy violated. Under this initiative, law makers would have to disclose more of their family's finances and business connections. You have to tell every asset you own, the name, address, and phone number of your clients and relatives if they "hold or seek contracts for services with any public body." For example, a banker would have to disclose the business interest of every client of the bank. CPA's and attorneys would have to tell about their clients, something protected by client privilege. This initiative is too broad, and too invasive. Some claim that this initiative can be passed now and tweaked later. But at what cost? Court battles and legal fees are expensive. It makes more sense to create a simpler initiative or bill that addresses the real issues and problems and isn't so far reaching and problematic. If we're going to do this, let's do it right without creating more problems in the process. "Proponents of these initiatives say the Legislature can always amend and improve the laws once they have taken effect. That's true, but lawmakers are reluctant to change a law that citizens have just approved at the ballot box." LaVarr Webb opined. It's important to get it right the first time! Many parts of this initiative are unconstitutional. Independent lawyers have found quite a few provisions that are currently unconstitutional. Why is an initiative being created that is unconstitutional from the beginning? Let's work within the law to create ethics reform. Sen. Howard Stephenson, R-Draper, said the initiative is so extreme that it violates basic constitutional rights — and as such can't be amended into legality. "The entire initiative seems to fly in the face of the Constitution," Stephenson said. "It seems to suspend the basic rights of free speech, free association and due process. I don't know why the (initiative's) sponsors are so brazen as to attempt this." It is my hope that we as Utahns can learn the truth about what is really going on here and stand together. Let's not allow a handful of people who want to change the political landscape of Utah to take away our freedoms, liberties, and handcuff our elected representative government. Please refuse to sign their signature pages, and tell your friends, family, and neighbors what is really going on with this bill. If we don't stop this bill, the great state of Utah will never be the same again. In the mean time, if you do want ethical reform, put pressure on your elected officials to do it properly.